The Use of Moved Clocks: How this challenges Special Relativity. Einstein's special relativity has as one of it's primary tenants that the speed of light is exactly C for all inertial observers. Herein I explore a thought experiment which demonstrates that if one uses synchronized clocks and meter sticks to measure the speed of light in one direction, and then back, that the speed of light has to be different in the two directions for at least one inertial observer. This requires making some assumptions that are not much of a stretch - you need to be able to synchronize clocks (already done in GPS), and you need to be able to define which observer is moving faster. We also need to ignore the Einstein clock synchronization method usually used in special relativity (SR). One of the big problems with the theory of relativity has to do with how it synchronizes clocks. According to Einstein’s method, the speed of light is defined by measuring the time for a two way propagation of light to proceed from one clock to a distance mirror and back. But what if C is not the same in both directions? Relativity assumes it to be so a priori. Our thought experiment is designed to settle the issue by looking at the predictions made by any medium of space theory where there is a preferred frame for light, and comparing this to predictions made by SR where the speed of light is supposed to be constant for all inertial observers. clocks are also synchronized and counting in Earth time. The space clock S1 is positioned to be directly beside the Earth clock E1 when Earth passes by S1 in its orbit, and starts at the same time as when the beam of light leaves E1. Synchronization is not a problem because they are side by side at that moment (verified by contact). 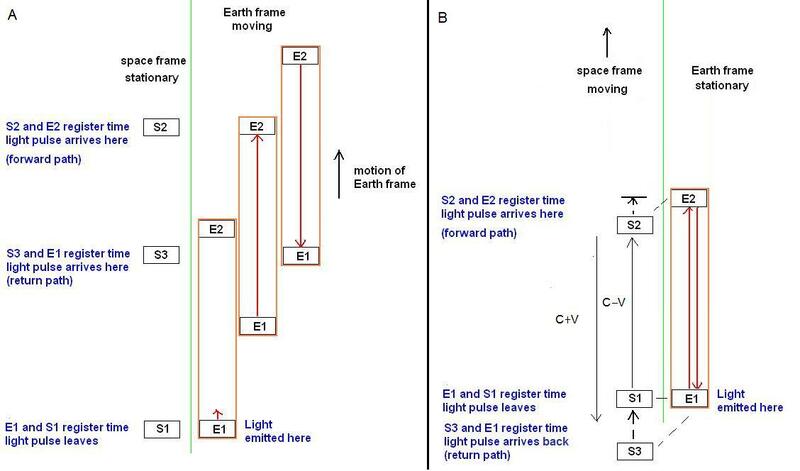 The space clock S2 is at the exact position where the mirror will be on the Earth (at clock E2) when the light beam on Earth reaches it and is triggered at the same time because at that moment they are also side by side. Finally, clock S3, synchronized with the first two, is at the exact position where clock E1 on Earth will be when the return light beam arrives. It might be considered a problem coordinating the positions of the space clocks to match those of the Earth clocks - to remidy this, we could think of space as having a line of consecutive synchronized clocks, and the clocks that are triggered are the ones that are in the correct position when the light reaches each Earth clock. A common standard of length is used - a meter stick on Earth. If two clocks on Earth are 1000 Earth meters apart, then the two corresponding clocks in space will be 1000 Earth meters apart, since they trigger only when they are in the same space at the same time. Therefore there is simultaneity of both length and time. We are not concerned that the length of the Earth meter may appear to be longer (relativity) or may actually be longer (Lorentz theory) in the space frame, - if we want to switch reference lengths we can easily do this by adjusting the meter length by the factor 1/(1-v2/c2)1/2 when it is moved from the Earth to space. The important point is that the spaces clocks are in exactly the same place at the same time as the Earth clocks when they meet the beam, so that we can be sure that the lengths between them are perfectly correlated, regardless of which meter stick we use to measure with. Table 1: On Earth Prediction: Space is preferred frame, Earth is moving at V with respect to it. Table 2: In Space Prediction: Space is preferred frame, Earth is moving at V with respect to it. Table 3: Earth or Space Prediction of Special Relativity: Earth V has no effect on C.
Since the Earth frame is moving - clock E2 has moved 0.1 meters with respect to space when it is triggered, which is added to the space length measured. Since the Earth frame is moving - clock E3 has now moved 0.2 meters with respect to space when it is triggered. This is subtracted from the first 1000.1 meters to get 999.9 meters as the length measured in space. Space clocks display absolute Earth time, slowed down from uncorrected space time by the factor: (1-v2/c2)1/2. Earth clocks display Earth time, and can display uncorrected space time if they are sped up by 1/(1-v2/c2)1/2. Table 2: Speed of Light (Space Observer): = C both ways, distance is 1000.1 m and 999.9 meters. In considering Fig. 1A, the Earth time and space time that has elapsed (corrected to Earth time) agree on the one-way elapsed time for the preferred frame model, but not the Relativity model. We find that they agree because the speed of light is different in the two directions for an Earth observer but the distance is the same, but for a space observer it is the reverse, the speed of light is the same in the different directions but the distance is different. When one then uncorrects the space clock to count in the actual time that it would display on its face, one gets a longer elapsed time. According to this time, the speed of light is no longer C in space, but 2.9997E8 m/s on average. We arrive at a situation similar to that of the Sagnac interferometer - one observer (on the axis) sees the speed of light as constant and the distance different in each direction, the other observer (on the rim) sees the distance as the same, but the speed of light different in each direction. Correcting the clocks to one another does not change this relationship, nor does correcting for the length viewed in Earth meters vs. space meters. The ultimate result of using a synchronized time and a synchronized length is that the speed of light must by definition be C+V and C-V in at least one of the frames, contradicting the postulate of relativity that the speed of light is constant for all inertial observers. This is why relativity must use the Einstein time synchronization method and suggests that clocks in different inertial frames can't be synchronized, since otherwise we lead to this (real) contradiction (1). The only requirement to get to this result is that we need to know to begin with which way to calibrate the moving clocks, i.e. is space moving slower that the Earth, or is it moving faster. In most situations this is definable - the Earth's orbital frame is moving faster than the Sun (heliocentric) frame, the Earths diurnal rotation frame (ECEF) is moving faster than the frame of the Earth's pole (ECI frame), etc. And ultimately, the relative velocity of objects can be referenced to the Cosmic Microwave Background, which appears to be a true rest frame for the universe. Table 4: On Earth Prediction: Earth is a preferred frame, Space is moving at V with respect to it. Table 5: In Space Prediction: Earth is preferred frame, space is moving at V with respect to it. The frame that is moving faster is consistently the one where the speed of light doesn't equal C in either direction once all clocks and lengths are synchronized. This exercise shows that it is possible to synchronize clocks in two velocity frames, by moving them in accordance with the corrections due for velocity and distance, and correcting them for their relative velocity. When this is performed, the clocks agree that the one way speed of light adds and subtracts with the velocity of relative movement between the frames, and uncorrected clocks reading in one frame or the other will give erroneous and contradictory readings. This is a consequence of our fore-knowledge of which frame is faster, information which is usually available to us, as well as our objective acceptance that relative motion is tangible and measurable. After synchronization, if we go backward and re-apply all relativistic corrections to that of a local observer, the difference in the one way speeds of light do not go away, since the corrections affect the one way speeds of light in an equal manner. If a result of synchronizing clocks and lengths in two frames is that the speed of light can be shown to no longer be constant, then the premise of real time dilation collapses - this suggests that it is the clocks, and not actual time, that are affected by velocity. 2) Su, C. C.,(2001) "A local-ether model of propagation of electromagnetic wave." 3) Ives, Herbert, (1953) "Is there an Ether?"